Nannies in LA is a leading nanny placement agency providing childcare services in Los Angeles and the surrounding communities. At Nannies in LA we recognize and appreciate that finding a suitable childcare provider can be a challenging and time-consuming experience; our dedicated consultants work to provide the most appropriate solution for your family. Every nanny has a particular method of conversing, educating and raising children - our consultants take extra care to match a nanny with your family’s ethos, traditions, expectations, and requirements. Our agency ensures all nannies undergo strict vetting procedures, which we have developed over many years in the industry. We have industry leading standards for our candidates; it’s no wonder then that over 80% of clients and candidates contact our agency through word of mouth. Our nannies are honest, caring and reliable. We require all our sitters, nannies, and professionals to have a college education, years of experience working with children, and superb references. The majority of our sitters, nannies, and professionals hold degrees in education, psychology, or early childhood development. We require all our professionals hold certifications in CPR and First Aid. In addition to finding and placing nannies and sitters in Los Angeles and further afield, our staff provides continuous support, placement counseling and advice, and household mediation services. Please register your interest on our contact page and a Nannies in LA consultant will be delighted to help you find the perfect solution for your requirements. 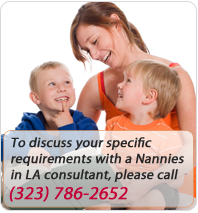 Nannies in LA serves the greater Los Angeles area, including but not limited to: Thousand Oaks, Santa Monica, Pacific Palisades, Malibu, Brentwood, Westwood, Beverly Hills, West LA, West Hollywood, Hollywood, Hollywood Hills, Studio City, Sherman Oaks, Valley Village, Encino, Tarzana, Woodland Hills, Calabasas, and Hidden Hills.